Most of us can relate to this. It doesn’t take long for the number of little bottles of paint to overrun a workshop. I’m currently looking at a few options – including laser cut paint storage racks available at my local gaming store. But I’m interested in the creative solutions that you’ve devised. So if you have solved your paint storage problem – and have a link to the rack manufacturer or to photos of what you did – share in the comments, and thanks in advance. I’m not looking for suggestions along the lines of “How about something like…” from people who have not done it themselves. I’m looking for ideas that have actually been put into practice. Let’s see what you’ve got! This entry was posted in Beyond Port Rowan in S, Workshop by Trevor. Bookmark the permalink. I use a silverware sorter (with a flat wood bottom) to store paint. I need to get a smaller few to fit in the drawers, but the one I have works fantastically. I saw that on your blog yesterday! Great minds, etc…. I had the problem of not knowing what paints I had in stock, and invariably bought colours I already had. I thought that a Carousel storage unit would work but didn’t like the available commercial ones available. Prompted by a suggestion from Brian Walsh, I bought two rotating tray or plate units from trusty Canadian Tire. Then create a three wing vertical divider to suit my tallest paint jars, and mounted one above the other. The dividers are clear plastic sold for small picture frames instead of glass…this helps eliminate hidden and dark areas between the two rotating circular trays. After storing much of my accumulated paint jars and cans, I may add a third surface to this unit….thus taking up no further workbench space. I have photographs but do not know how I can share them with you. I had even thought of taking the unit and showing same at the S meet this fall. The skinny is that I went all-in on the storage suggestions Joe Fugate outlined in his Guide to Acrylic Painting – specifically, a nail polish rack. Check out the blogpost for details and photos. I have trays separated generally by type of paint (i.e. acrylic, enamel, little testors enamels, British paints, etc) for stuff in tins or jars. Inside the cabinet, I have several larger plastic storage tubs with spray cans, cheap artists acryllics, overflow and anything that is too tall for the drawer. For me, its definitely a make do in the limited space my apartment affords for my workbench and storage. I don’t know about others, but I know i have a lot of problems with paint hanging around too long and no matter how carefully i’ve cleaned the lid/treads before it closes, having the paint expire and solidify before I can use the whole jar, which is immensely frustrating given the cost and sometimes scarcity of paints these days. Your post prompted me to write a few of my own thoughts too on my blog to add to the collection of paint organization posts this week! Also, your local gaming store, DuellingGrounds off Bloor by Dufferin Mall? If it is i’ve gone in but don’t think i’ve ever bought anything there. The few Vallejo paints I have are from Wheels &Wings on Danforth. Wheels and Wings is becoming a favourite of mine. But my local gaming store is Meeplemart on Spadina south of Dundas. It’s huge, well stocked and well priced. Never heard of Meeplemart, which is terrifying as its only about 10 minutes from my office and i walk home up Spadina a couple of nights a week. I’ve literally managed to never notice it. I know what i’m doing after work some day next week! OK it would appear from others that I went the deluxe woodworking route and created a multi functional storage area for both paint and cars/engines under work. I ripped some lumber roughly 4 inches wide to make 5 shelfs that are set inside a wood frame. Each shelf to hold paint was drilled with a Forstner bit to make a small hole which allows the bottle to sit inside it and reduce problems with tipping. Bottles are staggered to that I can see what I have available. My lower two shelves were slotted to a width to set car wheels inside the grooves. I attached a piece of cork board to the exterior side of the bottom most shelf so that I could tack plans onto it for reference during the build. All told it took me an evening in the wood shop to build. In a word: Pinterest. Poke around and you will see some very clever solutions some of which could fit the bill. There will also be pointers to the many paint stands that are now available thanks to the proliferation of laser cutters. Actually, I am think along the lines of some sort of rotary stand which takes up less bench space and gives good access to many paints at once. I have to see if a spice jar stand would/could work. 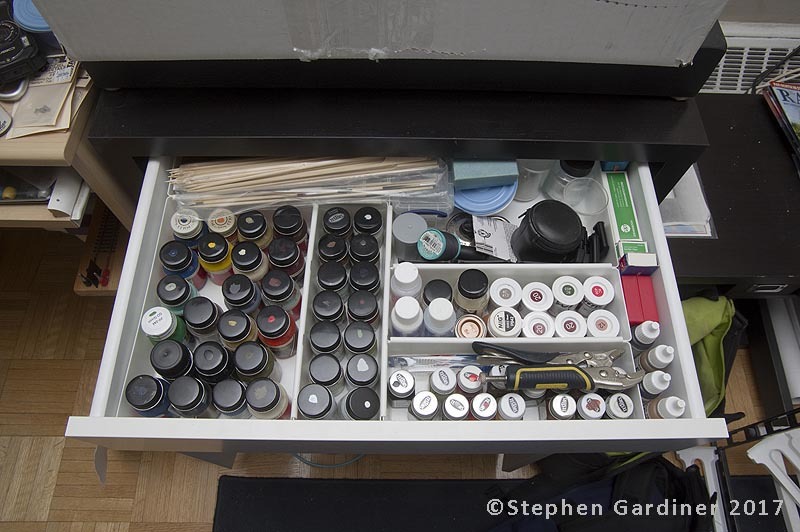 The top three drawers are good for short, squat bottles, the taller drawers for spray cans and the Euro-style droppers. The bottom drawers are filled with miscellaneous tools and supplies. Warning: The casters are not the strongest and I have had a collapse or two based on loading. I also have the half-height unit under my bench but had to remove the casters for it to fit. When I get enough paint (running down my old Polly Scale and building up Model Flex), I am going to take the nail polish rack approach as outlined in the MRH acrylic painting guide. Right now I store everything in a open container like yourself. Funny you should mention that – I just picked up one of these today at my local wargaming store. My layout sits on a collection of 4-foot tall custom-built cabinets, many of which have drawers. I dedicated one drawer to the Floquil/PollyScale paints. I prefer to store my paints upside-down, so I built a drawer divider that holds them in place, and then I roughly grouped them by color. You can see the article I did about that for my web site a number of years ago. I still use that same drawer.